The perfect place to stay for business or pleasure!!! Moore's Mountain Inn sits along the Yellow Breeches Creek in south-central Pennsylvania. This 1798 brownstone tavern has been graciously restored to include three charming guest rooms each with private bath. The owners are also avid gardeners and the landscaping reflects this. We are conveniently located near Ski Roundtop and Messiah College just 10 miles south of Harrisburg, PA. The area is rural, but our close proximity to to I-81, and the intersections of routes 15, I-83 and I-76 make area businesses and attractions easily accessible. Those who are traveling on business or for pleasure have found their stay with us affordable, secure, and more enjoyable than an impersonal hotel or motel. We are also the perfect pit-stop for “Snowbirds” traveling to and from warmer climates! Rooms can be booked individually or in groupings. We also offer a weekly discount of 15% for individual rooms and 30% on groupings, and a monthly discount of 20% on individual rooms and 40% on groupings. Click on the links below to go to our AirBnB listings where you can see reviews, check rates and availability, and book and pay online. Or, if you prefer, you can contact us directly to make a reservation. Moore's Mountain Inn is located in the rolling foothills of the Appalachian Mountains. It sits along the Yellow Breeches Creek, an officially designated Pennsylvania scenic river. You can and enjoy cycling, jogging, or walking our 2 mile nature trail that starts from our doorstep and includes the George and Rita Garstad Nature Trail in Lower Allen Community Park. You can also try your hand at trout fishing, tubing, or kayaking on the Yellow Breeches, or just sit back, relax, and take it easy. 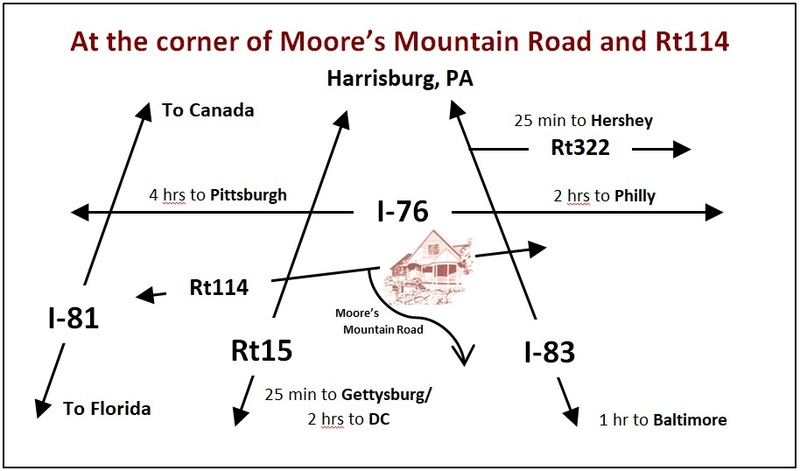 We have a Mechanicsburg, PA mailing address, but we are located near the town of Lisburn on the corner of Moore’s Mountain Road and PA Route 114 (Cedars Rd). The inn is a brownstone with a wood-frame addition. A stone wall with a white horse fence atop surrounds the front gardens and grounds. In 1798 Adam Brazier erected a brownstone tavern overlooking the Yellow Breeches Creek. Across the stream was New Lisburn, a Scott-Irish town established a half century earlier. Lisburn, as it is known today, was a thriving metropolis and a midway point for travelers going between Carlisle and York - Harrisburg wasn’t even on the map! The stone tavern, like most taverns of that era, doubled as an inn and for many years hosted area travelers. The bustle around New Lisburn eventually disappeared and the tavern along with it. During most of its 200 year history, the structure has been used simply as a residence. However, there is also evidence that during that same period it served as a tannery, general store, and tobacco shop. There is little known about the inn during the Civil War period, but records show that Lisburn, and probably the tavern, was occupied for a short time by confederate troops. In 1987 the structure was purchased by the Moore’s. They refurbished it and, in 1993, opened Moore’s Mountain Inn to revive a tradition started nearly 200 years before. “History is destined to repeat itself.” A saying which has certainly held true for Moore’s Mountain Inn. Two centuries after its construction, an old inn is once again offering hospitality and overnight stay to area travelers. And although we’ve never seen him, a previous owner reported encounters with a friendly ghost – perhaps old Adam Brazier himself is still keeping shop here!